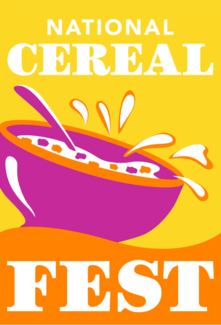 Volunteer Roles for the 2019 Battle Creek Cereal Festival. Volunteers will check-in in the McCamly Place Atrium and given directions for where there opportunity will be located. Set up serving stations tents and tables; Set up information tents and vendors; Reception Tent; Clean all tables; Place table cloths on picnic tables and serving station tables; Set out bowls, spoons, and napkins at serving stations. Me and my 3 kids will help but if they are not welcome I can not volunteer because of no sitter . Canvas festival area looking for and picking up trash from the ground, ensure that trash cans are not overflowing, remove full trash bags and replace. Assist with distribution of milk and juice. Set up sponsor tent, hand out breakfast, pour cereal, keep serving area clean, communicating stock needs. Ensure the safety of of festival attendees at marked entertainment; making sure people are following the policies and procedures, people are aware of where attractions are, communicating with correct personnel in case of injuries or emergencies. Handing out shirts, grabbing supplies from storage as needed, directing volunteers to their correct positions, directing vendors to their designated spots, ensuring volunteers are aware of their duties, and that all volunteers are aware of the CCHD rules. Handling of maps to festival attendees, directing festival attendees to specific areas, communicating with emergency personnel, and any other assistance needed per the public safety tent supervisor. Filling volunteer holes and needs throughout the festival. Reports directly to the festival coordinator and the volunteer table. This includes any of the following job descriptions as well as any additional needs per the festival coordinator. Tearing down tables and tents, ensuring the trash/recycle bins are in the correct spot for pick up, picking up trash, tearing down boxes, cleaning up sponsor tent supplies, wrapping cereal pallets, and any other tear down needs per festival coordinator.